Healthcare’s harsh business reality is that no one can afford to underestimate or ignore the competition today. Healthcare’s harsh business reality is that no one can afford to underestimate or ignore the competition today. With the upheavals of healthcare reform, the “once-upon-a-time” story of quiet camaraderie among provider practices has become an unprecedented competitive revolution. The lingering legacy, however, is that many doctors rarely think of their professional colleagues as competition. There is a tendency for many physicians and surgeons to see themselves as a band of brothers and sisters in white coats. Each and all are members of a fraternal league with a higher calling. These days, competition is a fact of business life, and the quantity and quality of your competition is growing rapidly. And if, for whatever reason, you don’t believe in marketing…take a guess what your competitors are doing. When we first began health care consulting nearly 25 years ago, we rarely thought about competitive advertising. At that time, competition was either nonexistent or it was so bad that it just wasn’t an issue. Today however, competitive activity in the marketplace is an essential consideration to be weighed seriously when we craft our clients’ marketing plans. As the most innovative doctors found success, physician marketing gained acceptance and traction with others. Eventually their competitors took notice and felt compelled to join the game. Budgets got bigger, markets got smaller and smart doctors sought sophisticated marketing help. Today large group practices and hospitals have advanced to the point where they often call us, looking for ways to contend with competition, protect market share, respond to market changes or grow their brand awareness. At the same time, old attitudes about practice marketing have dissolved. “Old school” stalwarts could not suppress the tide of new physicians who understood that they must market or become an afterthought. In the longer perspective, this makes sense. Younger physicians have entered a business world that is more competitive than their baby boomer predecessors. What’s more, they grew up with omnipresent marketing. Younger doctors are hungry for their own success, and are completely unimpressed by their more established colleagues’ appeals to simply wait (and hope) for new patients to somehow find them. It’s clear to them that passive game plans like that are no plan at all. As the business of the nation’s healthcare system continues to reinvent itself, every point on the care continuum has been altered…and not always for the greater good. From the solo provider to the ranks of the largest health systems, a troubling consequence is the unprecedented competitive revolution. 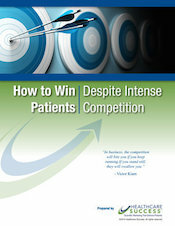 For more about dealing with the changing competitive landscape, take a moment to download our solution-driven special report: How to Win Patients Despite Intense Competition. This is a timely and informative must-read report for doctors, executives, administrators and healthcare leaders throughout the industry. What’s more, there’s no charge for this advisory report, so download your copy now.